Update – We now have episode 5 live below which see Brian play with Segways, jealous!! Update – We now have episodes 3 and 4 live below which see Brian head to the US of A! No doubt you have heard of Facejacker? 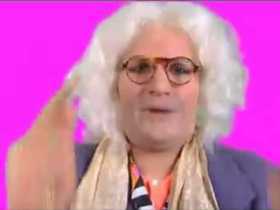 And then no doubt you have heard of the eccentric art critic Brian Badonde? Well the larger than life character has teamed up with search giants Bing for the 5 part online comedy series ‘The Art of Technology.’ The series follows Brian in his quest to learn more about how technology can enrich his already extravagant life, including a trip to LA, racing Seg-Ways and meeting the ‘world’s first search engine’! We are big fans of Facejacker and of course anything funny, and Brian Badonde is the latest character to launch an ‘online career’ (you will remember us featuring the new Alan Partridge Series). It seems that online is the new TV and we couldn’t be happier that comedy is now becoming much more reliant on technology and much easier to access. We will be featuring every one of the 5 episodes over the next few weeks on AJB so you better go and sign up to our rss feed. You can view the whole series on the Art of Technology YouTube Channel. This post is featured on behalf of Bing.